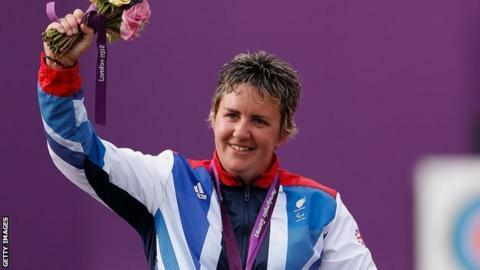 Norfolk archer Mel Clarke insisted there was no sense of disappointment after narrowly missing out on a gold medal at the Paralympics. The Worcester-based 29-year-old was beaten by Great Britain team-mate Dani Brown but added a silver to her bronze from Beijing four years ago. "It's absolutely awesome, I shot really well all day - I'm really proud of the way I shot," she told BBC Sport. "It came down to the last arrow and to be that close is brilliant." The former world and European champion was unaware before taking her final shot in the compound open final that a 10 would win her the gold. "I was just focused on what I was doing, I didn't know what score I had to hit - I knew it had to be a good shot," said Clarke, who only managed a seven. She had four 10s in her semi-final victory and went one better in the final with five. "I learnt a lot from the quarter-finals, I was quite nervous in that - but instead of being quite scary, the crowd really supported me, so I went out and just loved every minute," she commented. Clarke, who relocated to Worcester to be closer to her coach, said having friends and family in the stands to watch her compete had made her success even sweeter. "They've all experienced it with me, it's not me on the phone at three in the morning, saying 'oh, I've just won'. "To share it with them and see their reaction was brilliant - I couldn't have asked for more." She added: "There's been ups and downs (over the last four years), lots of training and injuries and stuff to get over. "It's been a rocky road but every single minute has been worth it now."